Seema is 30 and lives in London with her mum at the moment. But that is all about to change! She has just bought a flat with her boyfriend and is getting married in September. She would love to be in better shape for her wedding. A serial-snacker, Seema loves her biscuits, crisps and chocolate bars and even carries a lunch box around with her full of these snacks, just in case she gets hungry. She eats a lot of rice and chicken and loves curried mutton. But she also eats lots of microwave meals for convenience and loves to eat out at places like Nando’s and Pizza Express. She does have a sweet tooth but, even when she’s not eating chocolate, her cooking consists of home-made, family recipes that have been handed down through the generations that contain a lot of fat. 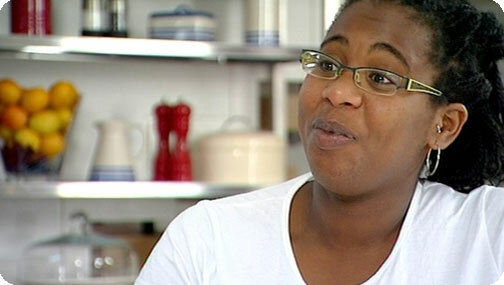 But the curried mutton doesn’t compete with her all-time favourite dish – Fried Chicken with rice and peas. Seema definitely loves her sweet, sugary snacks and she likes to have a good selection to hand. Gizzi decided that this was the first thing to tackle with her. 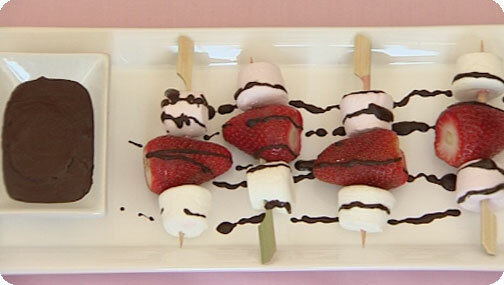 She said she was going to give her a recipe for marshmallow and strawberry kebabs with chocolate sauce. The trick when you’re trying to cook yourself thin but want to use chocolate is to use really good quality chocolate which is at least 70% cocoa so you don’t need as much because you get more of a kick. And, using dark chocolate is better because it doesn’t contain milk fat – good tip there! Marshmallows are also a good sweet thing to use if you have a sweet tooth because they have no fat content. Oooh, another tip! With Seema’s old sugary snacks she was polishing off 540 calories a day. Gizzi’s sumptuous Strawberry and Marshmallow kebabs with dark chocolate dipping sauce come in at just 190 calories per portion. A saving of 350 calories! Gizzi told Seema to dig in and asked her what she thought. Seema couldn’t say, mainly because her mouth was full! But she was making some encouraging noises! Losing weight isn’t just about the food you eat and how much you put in your mouth. Burning off calories is just as important with the added bonus of then being able to add those burned calories to your daily allowance. All Seema has to do is ditch the expensive gym membership and buy herself a skipping rope. Just 15 minutes of vigorous skipping could burn up to 285 calories. If Seema skipped every day for two weeks, she could lose an extra pound and, it’s great exercise for her shoulders and arms! Seema, again was shocked. It all added up to 60 grams of fat in her favourite Mutton Curry! Nearly her entire recommended daily amount in one go! Goat meat is even lower in fat than chicken! But it is worth ditching the coconut milk because 1 can contains 70 grams of fat! Seema’s fatty Mutton Curry with Deep Fried Dumpling stomps in at an amazing 60 grams of fat per portion. Gizzi’s Goat Curry with Rice and Peas tiptoes in at just 7.9 grams of fat per portion. A saving of over 50 grams of fat! ‘I could live with that I think. Well done, I’m impressed!’ Gizzi was triumphant once again! Gizzi started off by asking Seema if she knew how many calories would be in her normal Fried Chicken and Rice. Seema said she thought it was about 550 calories. When Gizzi told her it was almost 900 calories, it looked like Seema was about to hit the floor! Gizzi had decided to show Seema how to cook a Vietnamese dish with pork. She said it was a noodle salad with a bit of stir fry with griddled pork. Seema didn’t look terribly convinced! Gizzi agreed but said that Seema wouldn’t taste it in the dish but that it wouldn’t taste the same without it. It’s used as a replacement for salt in Vietnamese cooking and helps give it a unique flavour. Gizzi also used a pork fillet for the meat which is a super lean meat and she sliced it into medallions and bashed it flat. That’s a clever trick to ensure a maximum surface area to soak up the yummy marinade she had made. Two hours in the fridge and the meat was ready to griddle. Griddling meat is a much better alternative to frying it – it saves hundreds of calories by not frying it in fat. While Gizzi was putting together the meal, Seema did not look convinced. Gizzi asked her how she was feeling. Seema didn’t say much. Gizzi told her to trust her. Seema’s fat-filled Fried Chicken and Rice has a massive 900 calories per portion. 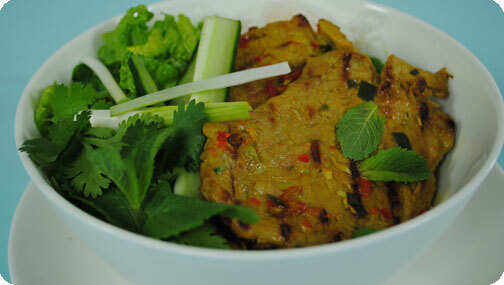 Gizzi’s Vietnamese Pork Bun Cha has just 426 calories per portion. Less than half! Seema got stuck in to taste the dish and said it was really nice, surprisingly! She said it had a good little kick to it with the spice. Gizzi asked her if she was enjoying the flavours and Seema said there were things she wouldn’t have thought of putting together, but that the outcome was good. Seema said that it had and that some of it had been a real shock. She said it was good to see how you can change things and that she was going to talk to her mum about the changes too! She did say that it would be a harder conversation with her mum than it was with her! Before Gizzi left, she gave Seema a gift. It was a set of measuring spoons for her, to help her cut down on the amount of fat she uses when she’s cooking in the future. If Seema just swaps her usual dishes for the alternatives that Gizzi has shown her and skipped daily, she could save over 5,000 calories a week and lose two and a half stone in just six months, just in time for her wedding! Now that is how you cook yourself thin!